The Illusionists: Live From Broadway, performed at State Theatre New Jersey recently. Their acts were mesmerizing and they took the audience to an altered state, making us laugh and believe in illusion. The team is comprised of five well known performers who are recognized on the world stage. Colin Cloud, the Deductionist, also known as a real life Sherlock Holmes, acknowledged that the fictional British private detective changed his life. Opening the show, Cloud invited an audience member to the stage and then had other people call out numbers which he calculated and translated into the exact day and time we were watching the show. Throughout the night, he read minds and knew the birthdays of audience members. Jonathan Goodwin, The Daredevil, was bound and hand cuffed hanging in mid-air with his mouth holding him up for his Iron Jaw act. With less than a minute to free himself, he succeeds and the audience is happy. He invited an audience member to the stage to lie down on a bed of nails numbering 1,000! The dispersion of weight caused no pain, but then he lied down on just one—ouch! And no blood appears! Jeff Hobson, The Trickster, tangled us in a few stories he weaved before uncovering magic. He reminded me of Robin Williams. He had one chair on stage with him that his family brought from Poland. It was the last of the set. He played around with a cardboard box by putting the chair in it and turning it upside down a few times. Voila! Multiple chairs appeared. Kevin James, the Inventor, was able to put a sliced man back together. Prior to the accomplishment, the headless torso walked off stage! Kevin wowed us when he walked into the audience and by the wave of his hand, turned a silent tissue into a dancing one. He then enlisted a young girl for help and before long the tissue was on fire, and then a red rose appeared. For her participation she won the Illusionist’s Ultimate Magic Kit. One of my favorites of the night was when white snowflakes came to life from his fist. Fake snow fell down on the audience and it all began with a little white magic dust. 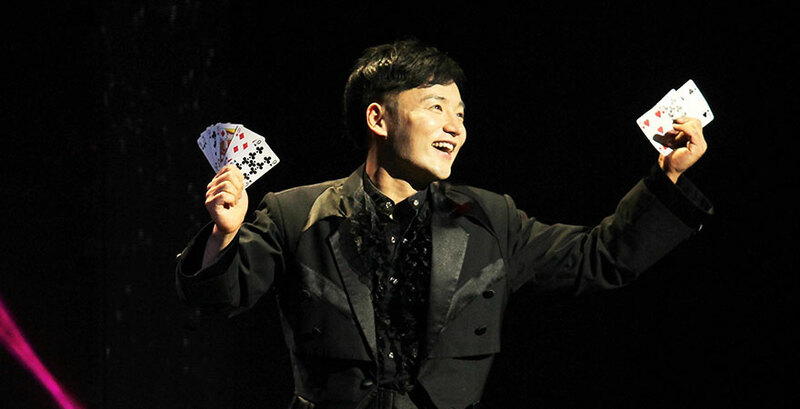 An Ha Lim, the Manipulator, performed card tricks. Endless cards streamed from his hands, his sleeves, from thin air. For the finale, he turned the cards into pictures of the Illusionists and the back of the cards spell out ILLUSIONISTS. He then turned them into the American flag, a nice gesture from this multi-country troupe. For the last appearance, there was a curtain with empty space behind it and then the Illusionists appeared, literally from nowhere. The diversity of the quintet kept the show interesting. They each have their own niche and the final result is a well-rounded show, bringing joy and surprise to the audience. They transported us to a world of magic, making it a memorable experience.